Posted on Thu, Jan 26, 2012 : 1:56 p.m. The official ticket distribution is done: Now it's time for the secondary market to take over for people who want to see President Barack Obama speak in Ann Arbor. Of the 3,000 people who received free tickets, some are already trying to sell. People sleep on the floor outside of the Michigan Union Ticket Office, inside of the Michigan Union, while waiting to get tickets to see President Barack Obama speak on Friday. As of early this afternoon, 18 ads were posted on Craigslist for tickets to the speech at the University of Michigan on Friday. Only two are seeking to sell, while 15 people are just plain seeking. One seller was seeking $350 for four tickets, and another was seeking $100 each. "We waited 10 hours in the cold for these bad boys," stated one ad that's since been deleted. Since tickets are free, under state law, selling them for a profit is illegal. Ticket-hunters have less than 24 hours to land a seat. U-M student Michael Schossner said he is willing to pay $25 to $50 and he's afraid that won't be enough with the plethora of people hoping to buy. "It's like trying to get football tickets," he said. "The man is so great, but tickets are so limited. My chances are slim to none." 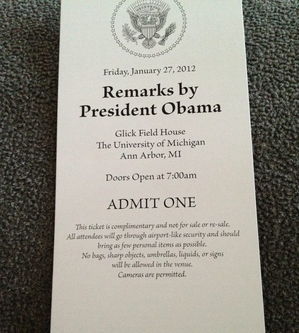 A ticket to Obama's speech Friday. Matthew Norfleet, a junior at EMU, said he is willing to cough up $70 to $80, and he feels optimistic about getting one. Norfleet admitted he didn't know about the line this morning. "Hopefully someone takes pity on a liberal college activist enough to give up a ticket", he said in a text to AnnArbor.com. "Otherwise I'll be watching on television like everyone else." Schonssner knew about the line, but the crowds he observed as he drove by at 7 a.m. scared him away. "There were already thousands of people," he said. "I'd probably have been number 3,001, so I just went home." Schonssner is holding out hope though. He said he plans to spend the day online anticipating a response. "I love Obama and he's a great speaker," he said. "I'd love to be there." Elizabeth Edwards is a social media intern for Annarbor.com. Reach her at elizabethyedwards@gmail.com or follow her on twitter. Thu, Jan 26, 2012 : 8:34 p.m. I'm not sure how these people plan to get tickets. We had to write our names on the ticket when we received it and the name on the ticket has to match the ID you present at Glick tomorrow... Perhaps I am ignorant about people's scalping capabilities. Thu, Jan 26, 2012 : 11:03 p.m.
Hope your right Becky. I would have thought Elizabeth Edwards could have figured this out if true! But then that would entail a little thought. Thu, Jan 26, 2012 : 7:35 p.m. Does this remind you of Willy Wonka? Thu, Jan 26, 2012 : 7:30 p.m.
Looks like some have enough money for everything BUT tuition! Thu, Jan 26, 2012 : 7:20 p.m.
Looks like having Obama as president isn't the big deterrent to capitalism as the right-wing sheep would have you believe! Thu, Jan 26, 2012 : 7:11 p.m.